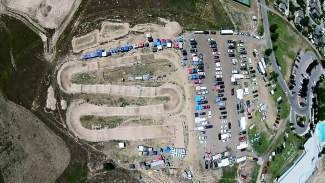 Eagle County BMX hosted its biggest race of the season as part of the Colorado State points series on Aug. 9. Over 322 riders from around the state came to Eagle to race. ECBMX would like to thank the following for their part in making a race like this happen. Thank you to the town of Eagle, Vail Honeywagon, WECMRD, Eagle Outside, Gore Range Landscaping, Bob's Place in Avon, Moe's Bar B Que, R.A. Nelson Construction, Spring Creek Collision, Arrigoni Woods, Studio B in Eagle, Vail Custom Home Builders, Ziegler Painting and all of the awesome track volunteers that worked countless hours getting the track ready to host the best riders from around the state. Simply put, we could not have made this happen with out your support. Thank you.